Published by Nicalis and developed by indie studios Pixellore and REMIMORY, this rogue-lite dungeon crawler action rpg puts a slight spin on the genre. 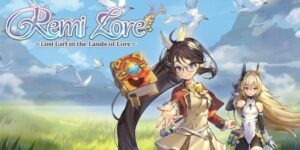 Michael enters the land of Ragnoah as he reviews RemiLore: Lost Girl in the Lands of Lore for the Playstation 4. An all-new hack-and-slash action game, RemiLore follows the journey of an ordinary schoolgirl named Remi and a supreme magic book named Lore as they battle their way through the anime-inspired world of Ragnoah.